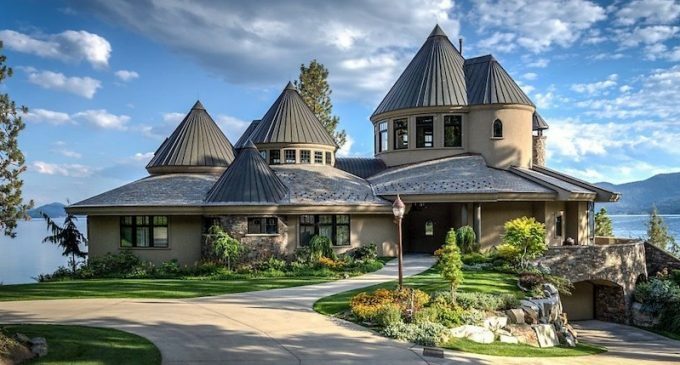 Entrepreneur Jaclin Smith has listed her intriguing waterfront estate on Lake Pend Oreille for the first time since its construction in 2006 for $14,350,000. Known as Château De Jaclin, after homeowner Jaclin Smith, the property spans 2.13 acres with 635 feet of private shoreline, a sandy beach, boat house and a charming guest house for overnight guests. There’s close to 8,200 square feet of space with large entertaining rooms overlooking the lake, a custom gourmet kitchen, three bedrooms, six bathrooms and circular home theatre. The property comes professionally landscaped with a heated driveway and mature Ponderosa pine trees. Jaclin made her fortune in the construction industry building healthcare and retirement facilities. Château De Jaclin is on the market for $14,350,000 with Sotheby’s International Realty. Be sure to take a 3D walkthrough tour here!